Uni Pasta — Eat a Duck I Must! Aaand we're back... (ish). Though the nights have been a little sleepless, we mustered the energy to produce this delectable restaurant recreation. A few weeks before baby made his appearance, we checked out Davanti Enoteca, one of the newest arrivals in Little Italy on Taylor. In a few words it's tapas meets Italian cuisine. And now it's become one of our new favorite affordable date night haunts. All of the dishes were solid and to our delight very reasonably priced. A jar full of savory chicken liver pate with crusty grilled french bread for $5.00? It's probably the best gourmet deal in town! Did I not mention that it was affordable?! One dish in particular stood out in our minds- Riccio di Mare e Granchio (linguine + sea urchin + crab). Uni in pasta? We realize this isn't a new concept, but we've certainly never had it before. After that meal, we see we've been missing out on it all this time! Uni is the perfect delicate base for a seafood pasta. It was our favorite dish of the night and of course Jared couldn't help but want to recreate this at home. 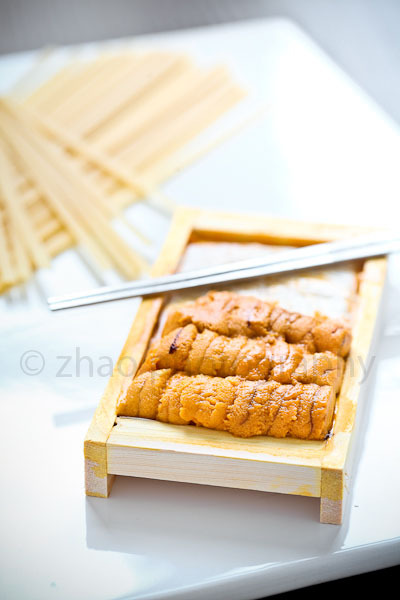 Normally we try to enjoy a block of uni like this slowly with sushi because well, uni is not cheap. I held my breath a little when Jared tossed most of it into his sauce, but we soon reaped the benefits of said gluttonous uni-tossing. The key to using uni in a sauce is to be careful not to mask the delicate flavor of the uni. Jared dialed back on all the other flavors in order to guarantee that the uni flavor came through. I mean, you did just dump all that precious uni in the sauce, you better be able to taste it! And this time instead of crab, Jared added a generous serving of perfectly seared scallops. 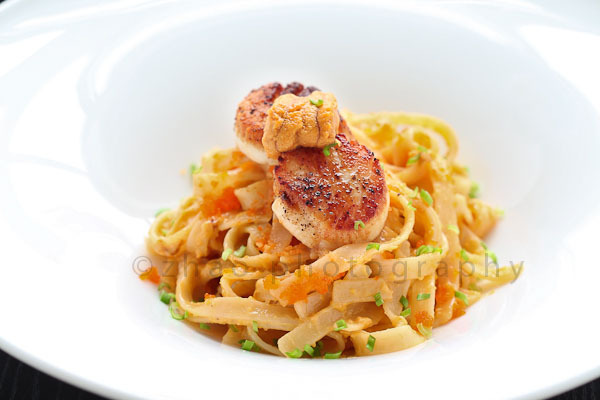 Plate the pasta and garnish with the scallops, leftover uni and chopped chives. I can't say we saved a ton of money by making it at home, but for about the price of one small restaurant dish, the both of had enough pasta to eat to our heart's content.